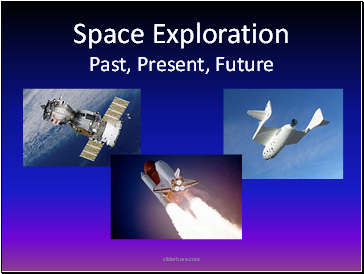 •Space Exploration The Big Picture Space exploration is still in infancy. 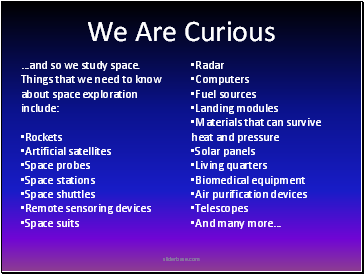 Although we have learned a lot, we still have a lot of questions. 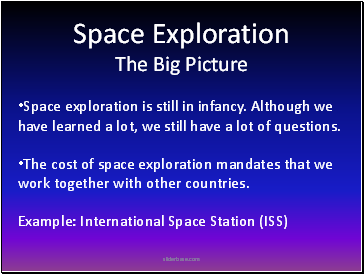 •The cost of space exploration mandates that we work together with other countries. 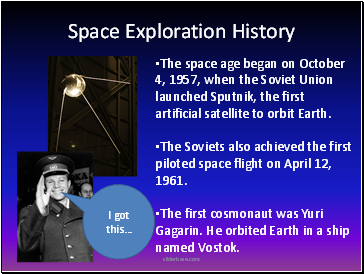 •Space Exploration History The space age began on October 4, 1957, when the Soviet Union launched Sputnik, the first artificial satellite to orbit Earth. 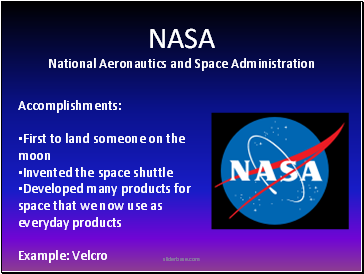 •The Soviets also achieved the first piloted space flight on April 12, 1961. •The first cosmonaut was Yuri Gagarin. He orbited Earth in a ship named Vostok. •Neil Armstrong and Buzz Aldrin landed Apollo 11 on the moon on July 20, 1969. •Neil Armstrong was the first person to set foot on the moon. 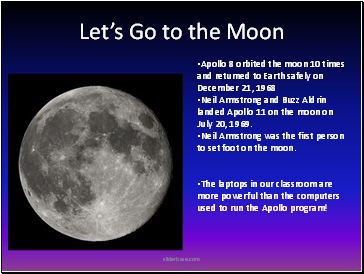 •The laptops in our classroom are more powerful than the computers used to run the Apollo program! •Space Shuttles A space shuttle is a reusable space craft. •Able to land on an ordinary airfield. •Two shuttle tragedies in 1987 and 2003. 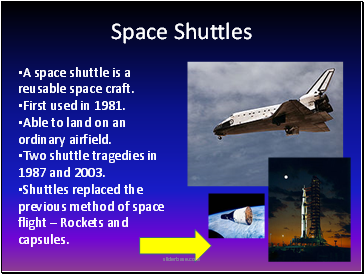 •Shuttles replaced the previous method of space flight – Rockets and capsules. 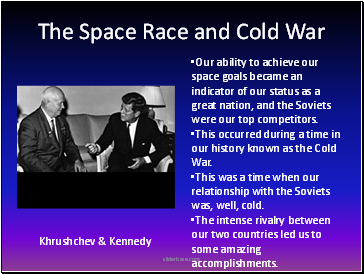 •Our ability to achieve our space goals became an indicator of our status as a great nation, and the Soviets were our top competitors. •This occurred during a time in our history known as the Cold War.